Dubai is rapidly becoming a hot spot as one of the world’s Best Beach Holidays. LUXURY hotel accommodation and tourism are the best that money can buy, and the white beaches of Dubai with palm trees everywhere on the edge of the desert provide a true Arabian getaway. It’s a far cry these days from its existence as a small Middle East fishing port in the 1950s. The amount of remarkable construction here is breathtaking, yet when you get to the centre of beach activity at Jumeirah Beach it seems far away. Jumeirah Beach itself is a long stretch of clean white sand, punctuated by those picturesque palm trees and beach daybeds with white furnishings that allow you to dream the day away. It will take you about 20 minutes to reach from Dubai Airport. The waters of these Dubai beaches are never cold, so swimming is pleasant all year round. 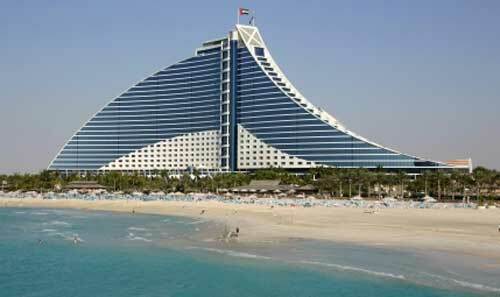 Jumeirah Beach is where you find the truly amazing collection of hotels put together by the Jumeirah Group. While we're usually concentrating on the quality of beaches, we would be remiss in this report not to show you some of the most spectacular beach hotels on earth. 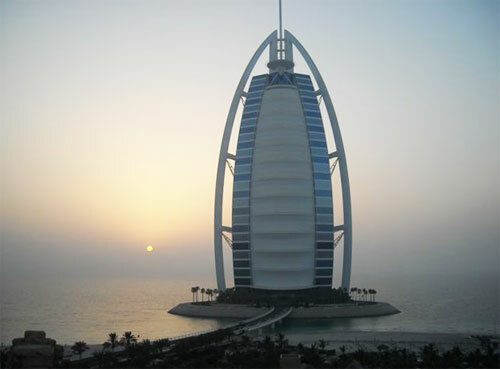 The most famous is the world’s only 7 star hotel, the exclusive Burj al Arab in the shape of a billowing sail, where you have to have a booking to get in, or be staying at one of the other Jumeirah Group hotels, unless you've made prior arrangements. 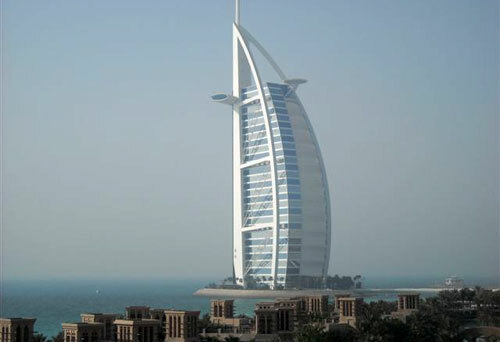 The Burj al Arab (translated as Tower of the Arabs) is currently the tallest hotel in the world. This luxury hotel is on an artificial island near Jumeirah Beach, connected to the beach by an exclusive curving bridge. Just down the beach is the family-orientated Jumeirah Beach Hotel, a favourite among tourists because of its on-the-beach location, marvelous facilities and splendid futuristic design in the shape of a breaking wave. The Jumeirah Beach Hotel provides a sense of endless space and light, with every one of the 598 luxury rooms and suites enjoying a spectacular panoramic view of the Arabian Gulf, thanks to floor to ceiling windows. Jumeirah Group hotels are certainly spacious; here at the Jumeirah Beach Hotel the smallest rooms are 50 square metres, huge by international standards and much larger than most European hotels. Our firm favourite in Dubai for a Best Beach Holiday is the Al Qasr hotel at Madinat Jumeirah, the fashionable beachfront hotel precinct made up of Venetian-style canals, waterfront restaurants and even a shopping centre that has it all, right on the beach. The reason the Al Qasr is our favourite beach hotel in Dubai is that it resembles an Arabian palace but it won’t cost you a king’s ransom to reside there. 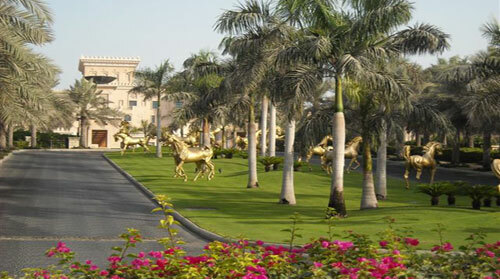 Where else in the world can you stay in beachfront splendour with spectacular gold statues of wild horses greeting you on arrival? This majestic mansion style hotel has 292 guest rooms and suites. It’s surrounded by water to become a virtual island - looking past the canals complete with ferrymen, across one of the world’s biggest swimming pools and out to the vast Arabian Sea with its stunning hazy sunsets. The main breakfast area is a wonderful building overlooking the pool with a buffet that reflects the generosity of the Arabian people. It’s such a delight to sit in air conditioned comfort eating a vast assortment of food as you look through big glass windows to the palm trees, daybeds and blue, blue pool outside. The pool is memorable not only because of its size, but also because of the smartly dressed lifeguards complete with headgear who are spaced close together right around the vast pool. 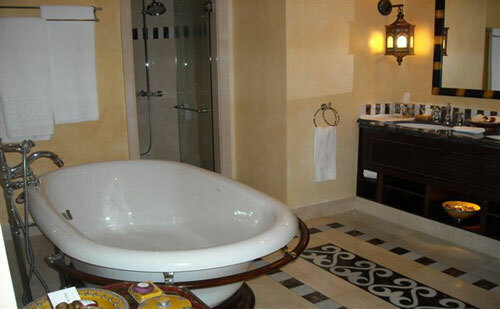 They are the personification of the safety and comfort you feel here on Jumeirah Beach. When you add the Wild Wadi water fun park to the attractions at Jumeirah Beach, you know you’re in exactly the right place for one of the World’s Best Beach Holidays. Be aware that in the middle of the year in summertime Dubai is usually very hot, so much so that your sunglasses will steam up when you venture out from air conditioning. On many days the maximum can reach 45 degrees Celsius or 110 Fahrenheit but you’ll be having such a good time on Jumeirah Beach, you’ll quickly acclimatise. 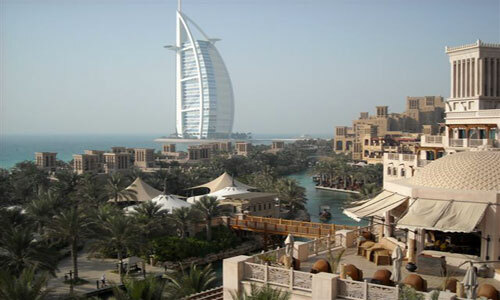 The Jumeirah hotels are really worth looking at on your beach holiday to Dubai because they really do offer peace and tranquility for the flustered tourist arriving after a long flight. Packages can include limousine airport transfers as well as access to Premium Leisure Clubs including breakfast, afternoon tea, all day beverages and pre-dinner canapés from 6 to 8pm. The hotel rooms themselves can only be described as beautiful. At the Al Qasr Hotel for example, you’re greeted with classic Arabian style in your spacious room, with king size bed and gorgeous canopy, rich marble bathroom including rain showers and in most cases a dreamy view across the Arabian Sea. The hotel beds really are the most luxuriously comfortable we’ve tried anywhere - and we’ve tried a few. You can see from the hotel room photos the thought that's gone into giving you a heavenly night's sleep - so many comfortable pillows in different sizes that you can make your own luxury hotel nest. If you can drag yourself away from your hotel room, go down through the gracious lobby to the Venetian-style canals, where you’ll be treated like a King or Queen as you’re transported to the waterfront restaurants. There’s a good Italian restaurant here at Madinat Jumeirah Dubai called Toscana with reasonable prices and dining inside or out. Just down from the Toscana is Trader Vic’s where you feel as though you’re in Africa waiting for a barge down river. If you’re staying at any of the Jumeirah Hotels, you’re given free entry to the 7 star Burj al Arab hotel or the Wild Wadi water park right behind it. This is such a refreshing water park to visit, where the young and young at heart delight in being saturated by a huge barrel that tips water over every one at regular intervals. This is where you’ll find one of the world’s highest thrill slides as well as an artificial wave that will more than make up for the lack of waves on the beach outside. 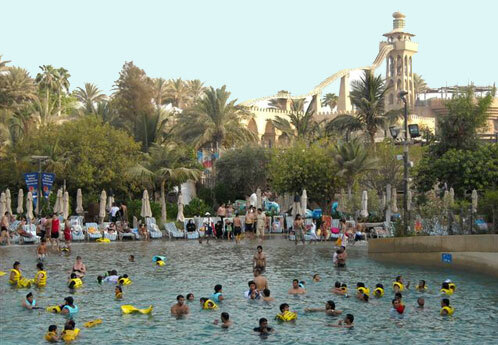 And what’s so endearing about this Arabian-style water park is the mix of nationalities thoroughly enjoying themselves in the water - from pale tourists to local women clad head to toe in traditional burqas while they swim. The shopping here is some of the best in the world, with everything from European fashion labels to lesser known creations at cheaper prices than you’ll find in Europe or North America. The best times to come to Dubai for shopping are when the sales are on in February and also July. And without a doubt the best place to shop is the amazing Mall of the Emirates, only a few minutes from Jumeirah Beach. This is where you’ll find most of the world’s famous labels at a cheaper-than-home price, and where you’ll find the paradox of the Middle East’s first indoor snow field in the middle of the desert heat! 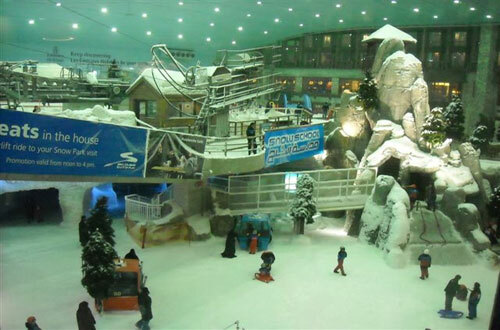 Ski Dubai is an ingenious ski field behind thick glass that allows shoppers to watch as skiers hurtle down five ski runs on genuine snow. As you watch from the St Moritz café at the base, you’ll almost believe you’re in the European alps as the ski lift takes skiers and snowboarders up to the top of the “mountain.” You can also sip a hot chocolate half way up the slope at the Avalanche Café, feeling chilly while it's very hot outside. If you want to see more of Dubai, the Big Bus Tour is identical to the open double-decker tourists buses you’ll see in London, complete with English-speaking guide on a microphone. You can jump on and off at your leisure and tickets are valid for 24 hours. You can see the real Dubai on the Red Route including the bazaars or “souks”, Al Fahidi fort and the Dubai Museum. The Blue Route takes in many of the best shopping malls and 5 star hotels. The best value is a family ticket for 2 adults and 2 children for US$134, or you can buy a single adult ticket for $52. For a glimpse of old Dubai, go to the Bastakia Quarter and its old alleyways, built by Persian merchants in the late 19th century. The United Arab Emirates government has made these beautifully restored old buildings a conservation area. This is where you’ll find many traditional wind tower houses, designed before electricity to funnel cool air through the living areas. You can see what these traditional homes are like at the converted Basta Art Café with its shady courtyard, close to a number of galleries in this district. And a memorable experience while in Dubai is taking a four wheel drive trip half an hour out of the city for Dinner in the Desert. Your driver will wear traditional Arab attire with no shoes before joining a convoy of vehicles sliding down sand dunes for an hour in what’s virtually a choreographed dance routine. You’ll even pass a genuine green desert oasis that will appear like a mirage before you’re given the opportunity of a camel ride. Then it’s dinner in the desert in a traditional setting with a sumptuous feast prepared before your eyes. You have a choice of many grilled meats and some companies will provide a vegetarian option. And just when you think it’s over, a traditional belly dancer arrives to complete your dinner that really is good fun. Construction in Dubai is literally hurtling along, including the new overhead rapid rail link from Dubai Airport straight to Jumeirah Beach and into the city. A staggering 25 per cent of the world’s cranes are currently in Dubai as resort operators, big banks and the world’s leading companies join the Dubai property investment gold rush. Local newspapers predict Dubai may become “the new Wall Street” while other reports predict this booming capital will soon overtake Singapore and Hong Kong as the world’s favourite shopping destination. Make sure you seen the stunning artificial islands being constructed while in Dubai. The Palm Islands are a breathtaking sight in the shape of a date palm with a trunk and 17 fronds as a crown with a surrounding crescent island acting as a breakwater. These islands will include boutique hotels, a retreat and residential areas with marinas and plenty of beaches. The World Islands are equally as spectacular because they resemble a globe of the world when viewed from the air. These man-made islands are being shaped into the world’s continents, divided up into 300 small islands for expensive homes, exclusive resorts and even community use. Some individual islands have already sold for up to US$35 million. So that’s Dubai, a genuine Best Beach Holiday that’s different but thoroughly enjoyable. 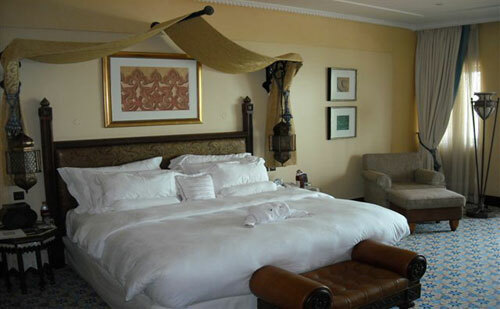 Dubai is a great destination for a relaxing break on a beautiful beach with all the comfort you need. And if you want more, there's all the tourism and shopping you need little more than a stone's throw away from the white sands of Jumeirah Beach. We thoroughly recommend Dubai as one of the world's Best Beach Holidays.